Rhythm sticks provide a great way for young students to have an active performance experience and learn to read rhythms. With the advent of "bucket bands," the experience has become even more fun. Bucket bands, in their simplest form, are groups of players using upside down utility buckets as drums. 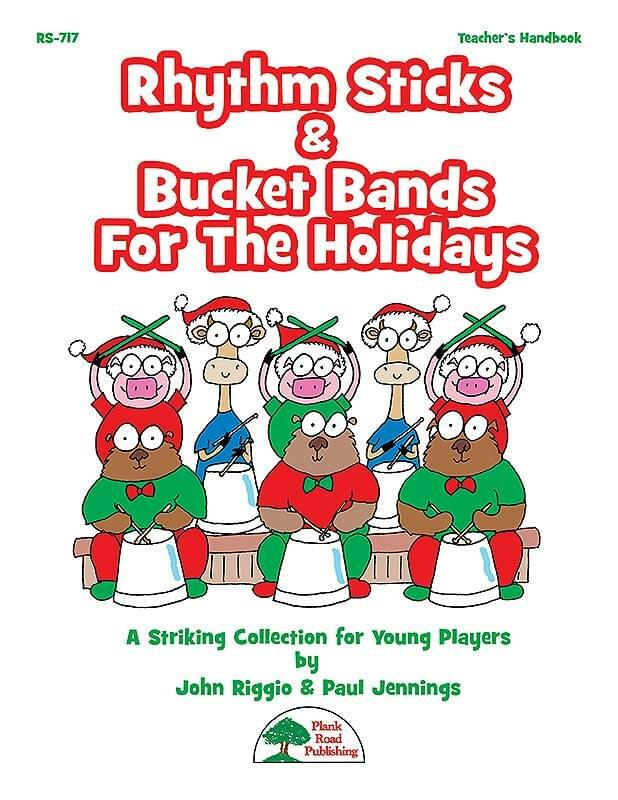 This creative collection brings you six new seasonal arrangements that can be performed with just the tracks and rhythm sticks, or by a young bucket band, or by combining the two. By purchasing this collection, you get parts for each group, as well as teaching suggestions. There are also ideas for forming a beginning bucket band, and downloadable scores that combine a lead sheet with both parts. Good King Wenceslas - The melody for this tune dates back to the Middle Ages, so John has written a Celtic arrangement that is perfect for your students to groove to. What Child Is This? - Even a tender song can be made to rock! Taken from the 16th century English melody "Greensleeves," this arrangement brings the song into the modern era with electric guitars and rock drums. We Wish You A Merry Christmas - We've taken this 3/4 tune and moved it to 4/4. With a driving bass line, power synths, and screaming guitars, it's sure to get your students excited about performing in your holiday concert. O Christmas Tree - Stately and beautiful, this rendition of the old favorite proves that even a pretty song can benefit from a good rhythm section. Carol Of The Drum - An obvious choice for any percussion instrument with energetic tracks and lots of fun for your students. Sing We Now Of Christmas - If you've performed John Riggio's version of this song from Music K-8 Volume 19, Number 2, you know what an exciting and jubilant tune it is! Although this is a slower arrangement, it's still a blast to play for young students.